Does this book have the potential to positively affect the behavior or future of those who experience it? Good teachers teach to improve the quality of audience members' lives. With this last question, PBT encourages you to consider the future of your listeners' understanding of God, their places in a family of faith, or their relationships with The Holy. PBT is all about connecting the content in picture books to scripture and/or spiritual truths so that spiritual growth can be more personally meaningful. Longer lasting learning occurs when theological ideas are connected to realistic situations or meaningful concepts. What affects you connects with you! Asking yourself how a picture book will positively affect your listeners is a worthy consideration that gives focus to your planning and teaching. As a nationally certified school psychologist, I’m passionate about improving social and emotional skills; those include spiritual skills. Modern psychological research is finding that social and emotional learning (SEL) and its affects on behavior is crucial for success in all relationships as well as in academic learning. For more on this critical link, check out www.casel.org. CASEL has identified 5 Interrelated Sets of COGNITIVE, AFFECTIVE, AND BEHAVIORAL COMPETENCIES: Self-Awareness, Self-Management, Social Awareness, Relationship Skills, and Responsible Decision Making. 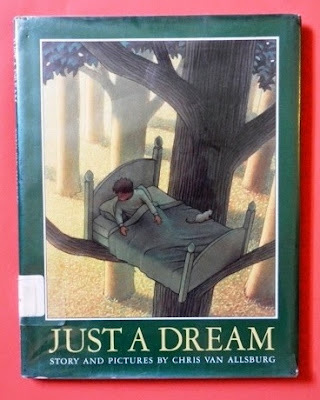 With this last PBT question, I’m offering an example book, Just a Dream by Chris Van Allsburg (see my PBT re-post where I offer it as a Grab & Go book [here]). It's a story of a careless boy and his discovery of an array of environmental concerns. Connecting this story to God’s desire that we have respectful and intelligent guardianship of Earth’s inhabitants and resources might inspire listeners to evaluate their relationship with the Earth. They could find connections between their behavior and the Earth’s health and see this as a God-ordained relationship. Additionally, this book addresses all 5 of CASELs competencies listed above. Here are a couple of amazing illustrations from Van Allsburg. First, I show a scene from Walter’s bad dream.